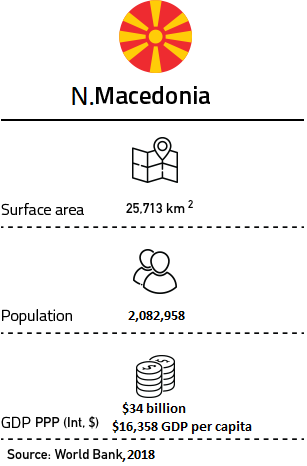 Macedonia relies on coal and hydro for its electricity generation, having wind and solar in small amounts as part of the energy mix. Electricity losses in transmission grid for 2016 are at 1.6%. Electricity losses in the distribution for 2016 grid are at 14.7% or 889 GWh of total distribution demand. Gas production capacity is 7.5% of electricity production. Production of crude oil or crude oil imports is 0%. Oil products constitute 37% of the total primary energy supply in the country. The district heating system in R. Macedonia is available in Skopje. They provide currently for only about 6.7% of the total heat demand. Mandatory target for RES by 2020: This target is participation with 21% of energy from RES in the final gross consumption of energy. As a signatory of the Energy Community Treaty, R. Macedonia is committed to meet the savings target of 9% or around 147.2 ktoe, by 2018. Greenhouse gas emissions in R. Macedonia are in 2016 around 11,000,000 tons of CO2 and in energy sector 7,660,000 tons of CO2 equivalent. R. Macedonia has calculated a potential emission reduction of 30% in 2018.